When we planned our tour of Higher Grounds’ Roastery and Coffee Bar in Traverse City, MI this past weekend we had no idea that this year marked their 10th Anniversary in business. Coincidentally, Shane and I were away for the weekend to celebrate our 10th Wedding Anniversary. 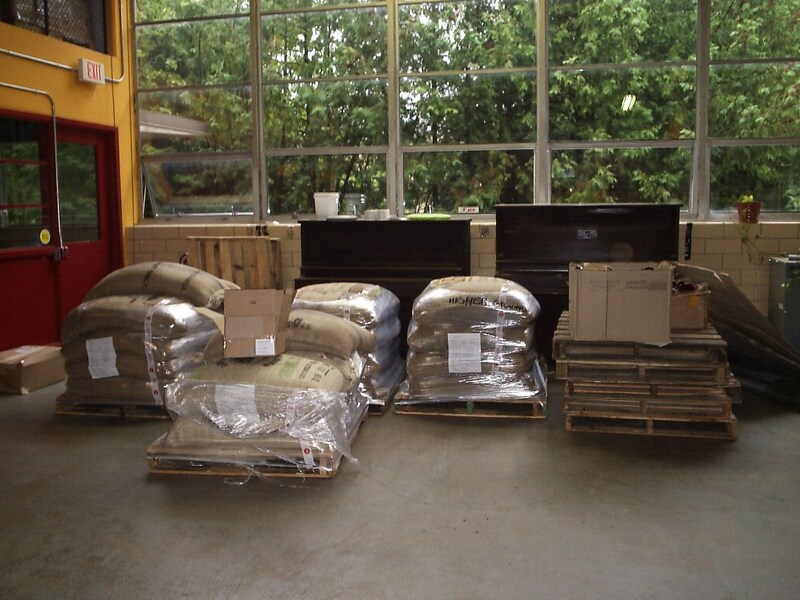 Higher Grounds is a full-fledged member of Cooperative Coffees, the fairtrade green bean importing co-op where we purchase 99% of our green beans. 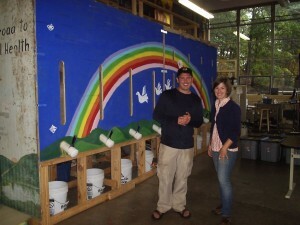 We were excited to meet them and learn more about their business and philosophies. 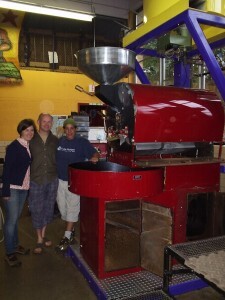 Our tour began with Jennifer in the Coffee Bar, followed by Karin in the Roastery, and Cupping Room. Jennifer does PR for the company including writing for the website and other social media. Karin works in production as a roaster extraordinaire. 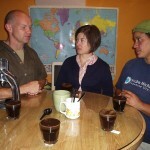 Both have in-depth knowledge of fairtrade coffee – from farm to cup. 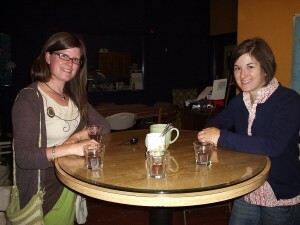 The Coffee Bar, located in the historic grounds of The Village at Grand Traverse Commons, would be a great place to hang out if you lived in Traverse City. They have tables and chairs outside, complete with a sandbox for the kiddies. Inside, more tables and chairs, and a shop offering fairtrade items and wares by global and local artisans. They offer brewed coffee, French-press, pour-over, or espresso, and goodies from a wood-fired bakery (also located in The Village). Sharing a windowed wall with the Coffee Bar is the Roastery. 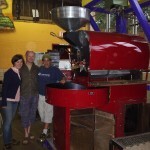 Higher Grounds`roastery is HUGE compared to our 165 square foot Roasting Shack. 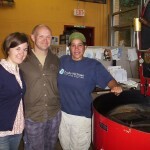 Karin roasts 50 lbs of coffee at a time using `Ruby`, a Diedrich drum roaster. 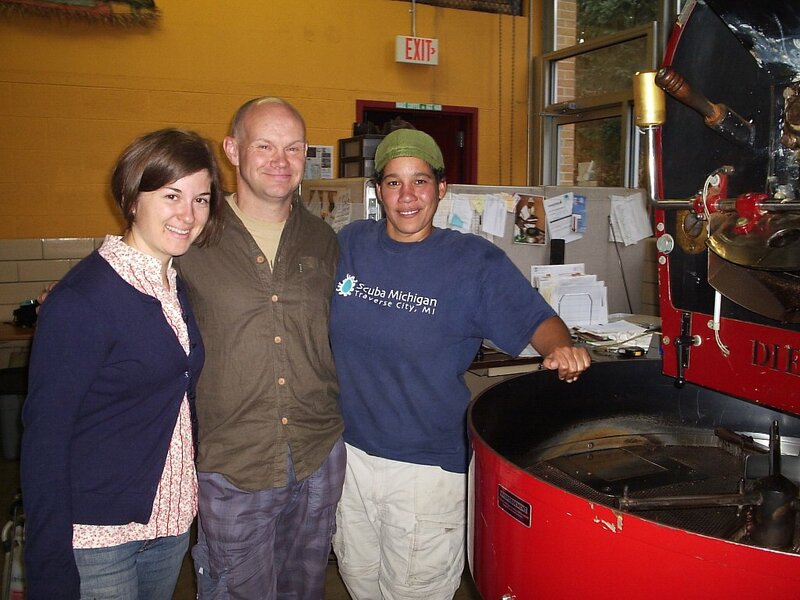 Shane roasts 8 lbs of coffee at a time using *We Need to Name Her*, our Sivetz Air Roaster. They receive their green beans each month, up to 19 pallets at a time. We receive our monthly order of green beans, 1 pallet at a time. Despite these differences, we were impressed that our production flow is quite similar. After three years in business, it feels like we are on the right path. We were excited for our Cupping session. For those of you who aren`t familiar with Coffee Cupping, it is (simplified) the art of smelling and tasting coffees, and describing the results. 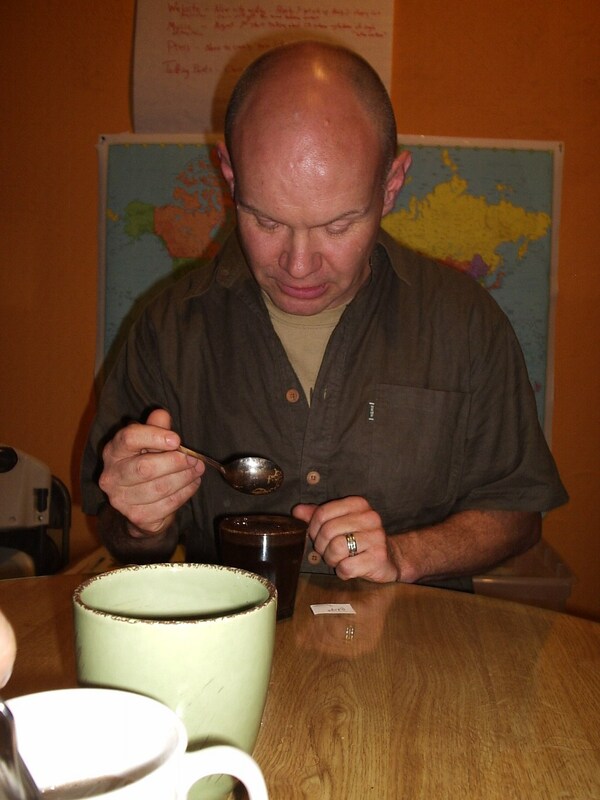 Shane and I cup our coffee on a fairly regular basis for quality control, and when we are testing new blends. 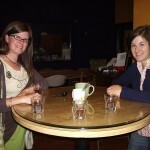 We are self-taught cuppers, and often end up in fits of laughter, coffee grinds in our teeth, speaking in British accents. 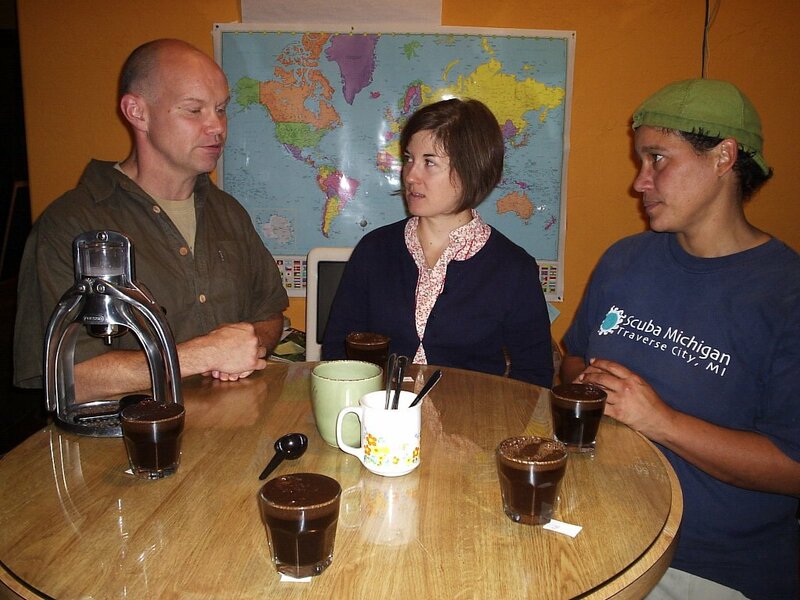 So, it was very good to have a get-down-serious cupping session. 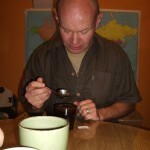 My favourite was the unwashed Ethiopian Sidamo (mmmmmmm. . . blueberries). Look for this coffee from us, starting in 2013! 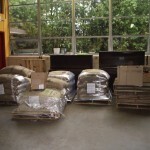 Higher Grounds was born from an effort to help the coffee farmers in the Chiapas region of Mexico. 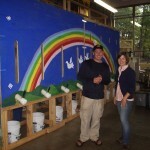 Chris, co-founder and owner, had been visiting this area with his then-wife. Before they returned to the U.S. they asked, “How can we help you?”. “Sell our coffee”, was the reply. They returned home with a bag of green beans and began roasting and selling coffee to friends and family. Out of this effort, Higher Grounds Trading Co. was born, and the Yachil cooperative in Chiapas, Mexico became a Producer Partner for Cooperative Coffees. And, Higher Grounds contributes locally, too. Their latest project, Michigan Coffees for Change, includes four specially created blends, each attached to a non-profit organization within Michigan. Profits from the sales of each coffee are shared with the corresponding organization. What a great idea! St. Joseph Island Coffee Roasters was born from a desire to align our business and personal values. We wanted to work at something that felt right, to feel that what we are doing matters, both globally and locally. After our tour, we have returned to our humble business on St. Joseph Island pumped full of ideas and re-fuelled with inspiration to help us reach our goals. Thank you, Higher Grounds Trading Co.!